Whether you own a home or are renting a room, we think it’s important you at least understand the basics of the electrical system in your home, in order to know what to do when something goes wrong. 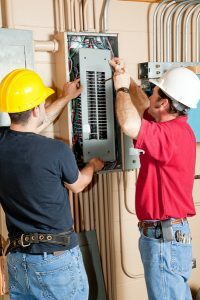 One component of your electrical system that is particularly important is the electrical panel—also referred to as the circuit breaker box. This is responsible for dividing up the electrical power in your living space into circuits. Perhaps you’ve moved into a home in the past where the electrical panel or fuse box was already labeled, so you could easily find which switch led to which outlet or appliance. But your current living space may not have come with this useful guide. So what can you do? Create one yourself! This is actually not a very difficult task—though you will want a housemate or a friend to help. This is a pretty easy job for two people to do together. First, though, ensure that nobody in your home will be inconvenienced by a temporary power outage. We also want to mention that it may be better for you to do this job during the day so you have better natural lighting, and also when temperatures are mild so you don’t have to cease use of your HVAC system. If your circuit breakers are not already numbered, now is the time to do it. You can use a sharpie if the breaker panel is a light color, or you may even just want to use small stickers that you can write the numbers on. Then, duplicate this numbered list on a piece of paper. Next comes the fun part! Shut off each of your breakers. You may want a flashlight for darker rooms or areas of the home, or you can use your smart phone. Then, turn on one circuit at a time, and ask your housemate or friend to walk around your home, testing outlets, appliances, switches, and lighting to figure out what circuit leads where. Do keep in mind that one circuit can lead to more than one outlet or switch, and can even lead to two different fixtures in individual rooms. Once you have correctly labeled your electrical panel, you can have peace of mind using it as you need to without any guess work. This makes your electrical system and your home safer, and makes your life more convenient. When an appliance or lighting fixture stops working, for example, you can try resetting the appropriate breaker to see if it fixes the problem. When all your breakers are correctly labeled, this can be done with ease. What if you find that you have breakers that don’t seem to lead to any switch or outlet? Or maybe a switch doesn’t seem to work no matter what breaker is on. These both indicate that it’s time to call in a professional electrician. We’ll be able to inspect your wiring and make sure nothing is amiss. For professional electrical services in Union, WA, contact Sunset Air today.